Call me to take action so I can protect your legal rights or the rights of a family member of the injured motorcyclist, especially after a serious motorcycle accident. The cards are already stacked against a motorcycle accident victim in many cases. Insurance laws do not require motorcyclists to insure themselves as fully as they can and should — and many motorcyclists do not realize that they should ask to add Medical Payment coverage to their insurance policies. At the Law Office of Jeffery A. Hanna, our primary mission is to represent the injured and surviving family members after serious accidents. We also take every opportunity we have to educate our clients and the general public of the importance of reviewing accidental injury policies to ensure that in a worst case scenario, medical bills will be paid and a family's financial well-being will be preserved. Your motorcycle accident injuries may include serious cuts and lacerations, bone fractures, back, neck or spinal cord injuries, or brain injuries. Jeffery A. Hanna recommends that you document your injuries in detail, and that you seek the best available medical care promptly. As soon as the emergency care of the injured motorcyclist is underway, a motorcycle accident lawyer who is best trained and best prepared should be retained to safeguard his or her rights to a fair compensation from all appropriate sources. 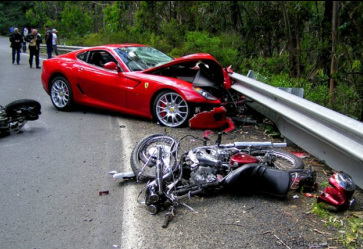 Contact the Law Office of Jeffery A. Hanna to schedule a free initial consultation with a motorcycle accident lawyer. We can help you.